X-ray is today one of the most popular imaging methods. Thanks to him, we can determine the pathological changes of bone structures, stomach, intestines, and other organs. Despite the fact that this method is inferior to CT and MRI in terms of information, he wins the ease of use, democratic prices. For many of the pathologies of the information obtained on x-ray, enough for a full diagnosis. Radiograph – it was on special, sensitive to x-ray radiation, the material image of an organ, obtained by the interaction of x-rays with human tissues. Bones contain more calcium than any other tissue in the body. It is the calcium and has the ability to absorb a greater amount of x-rays. Consequently, the bone pass the little rays through himself, and on the radiograph, their image will be white. Such fabrics are called radiopaque. Fat and connective tissue and the liquid medium tend better to skip the x-rays that is less to absorb. On x-ray they will have different shades of gray. The air absorbs the minimum number of rays. Almost all of them pass through it. On radiographs they appear the most dark color. changes in the size of the heart. Analyze the x-ray, doctors radiologists who receive special education. In addition, to decrypt the radiographs requires experience. Relatively well in the radiograph can deal with physicians in many specialties, however, the conclusion on a picture only gives the radiologist. Analysis of the radiographs is based on the presence of dark spots in the picture, the enlightenment, the definition of radiological symptoms and characteristics. 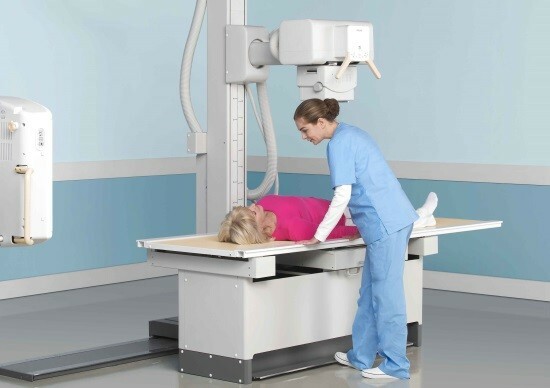 Immediately evaluate the quality of the x-ray, its clarity, structure, focus, brightness, and contrast. Then the radiologist goes to the analysis of the shadow features. Evaluated the symmetry of the structures, their integrity, contours. Chest radiograph are made more often. Images are judged on the structure of the lung tissue, transparency and airiness of her lung fields, the pulmonary condition of the skeleton, the thoracic spine. Determined by the symmetry of both lungs, the location of the diaphragm, the state of her sinuses, presence of pathological darkening, cord, cavity with fluid level. Bone radiographs allow us to diagnose fractures, their types, to determine the time elapsed from the time of fracture. After surgical treatment by repeated radiographs judge the effectiveness of surgical intervention and proper fusion of the bone fragments. 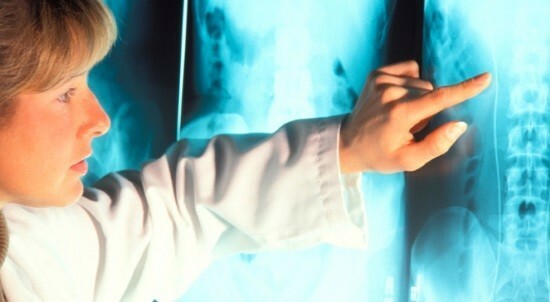 In the diagnosis of pathologies of the digestive system applied x-ray with barium. He is not absorbed in the body and is a radiopaque substance. Give the patient to drink barium, then at certain time intervals to consistently make shots. So judge the speed of peristalsis by the time during which the barium leaves every intestine. In addition, determine the internal topography of the gut. It can be modified by the tumor, a polyp, diverticula, inflammation. Diagnosed intestinal obstruction, perforation of the stomach or intestine, anomalies of development. But even the most informative radiograph does not allow to put the final diagnosis. It only helps to define him. The doctor radiologist only describes the suggests the diagnosis. Only the attending physician, on the basis of the radiographs and other data, may display the diagnosis, prescribe treatment.